Alright! Here we get to talk about if anyone of us gave our favorite demon an interview what would you say , do , or ask Sesshoumaru-sama . Okay , so you can ask any question , you can ask any that includes the anime , manga , or like anything...(OK).I had this feeling to sort of annoy him with an interview ! ;) OH yeah ! Also enjoy this pic of him angry at THE WORLD!!!! Will someone please reply I am trying soooo hard! 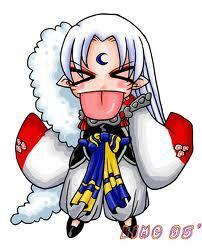 Lord Sesshomaru, do you like it when people call you Fluffy, and how does it make you feel? Sesshoumaru - sama will you let girls pet your fluff ? 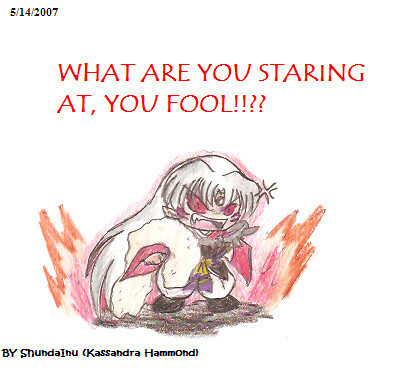 Sesshoumaru - sama do you adore your ....FANGIRLS ! ?